Windows 2000/XP/2003/Vista with Microsoft DirectX 9 or later; 30MB Free Hard Disk Space for program installation (512MB or above for flash movies); 128MB RAM (256 recommended); Windows compatible display with a minimum 800 x 600 resolution; Windows compatible sound card; Microphone and speakers (recommended) for recording narration; Macromedia Flash Player 8.0 or above (A necessity for previewing Flash movies). If you ever thought creating a video tutorial was a difficult task, then think again. DemoCreator, by Wondershare Software, enables the user to quickly and easily create interactive flash presentations, software simulations, tutorials and product demonstrations without requiring any skills in either programming or professional multimedia. The procedure is so simple even a beginner can do it. A graphical demonstration will hold a person’s concentration far longer than a numbered set of instructions and, because DemoCreator is capturing everything that is happening on your computer screen there is less chance of missing out a valuable instruction. DemoCreator gives you two options to create a new project; either by capturing screens, which is recommended, or, for the more advanced user from blank slides. Once you have clicked on the Capturing Screens options you are then presented with another menu giving you the options to select the capture area you want to use; this can be an area of an application, a specific, custom sized area, or full screen. While attempting to capture full screen and custom size appeared relatively easy I did find the Application capture a little frustrating in the sense that you have to select the application you want to capture from a drop down box. 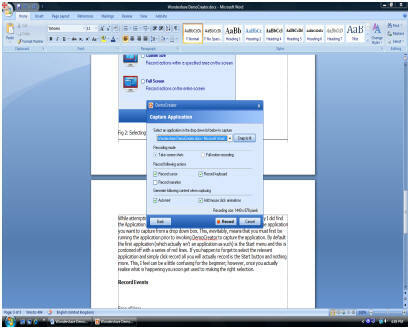 This, inevitably, means that you must first be running the application prior to invoking DemoCreator to capture the application. By default the first application (which actually isn’t an application as such) is the Start menu and this is cordoned off with a series of red lines. If you happen to forget to select the relevant application and simply click record all you will actually record is the Start button and nothing more. This, I feel can be a little confusing for the beginner; however, once you actually realise what is happening you soon get used to making the right selection. Prior to clicking the record button you have to make a few decisions regarding the recording mode. For this you have two main options: Take screen shots or Full motion recording. If you select the Take Screen shot option whenever or wherever you click the mouse a call out balloon will appear with the word ‘Click’ showing your audience exactly what you are doing. So, for example, if you click to change, say, a font (if you were using a Word processing application for instance) DemoCreator would insert a ‘visual’ prompt to say that you clicked on the font button and then will display the font sizes and would then record the font selected etc. Once you have recorded your demonstration/tutorial you will want to see how it looks. The first thing needed is to stop the current recording and this is easily achieved by double clicking on the DemoCreator icon in the notification area. 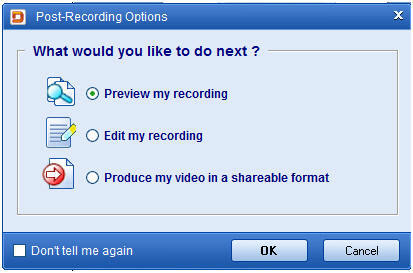 Once you have stopped the recording your creation is saved ready for you to preview. The post recording options menu then appears and you can select whether to Preview, Edit or Produce the video in a shareable format. If you select the default ‘preview my recording’. the recording is processed and converted ready for you to view. All you need do then is click the Play button to see just what your handy work looks like. 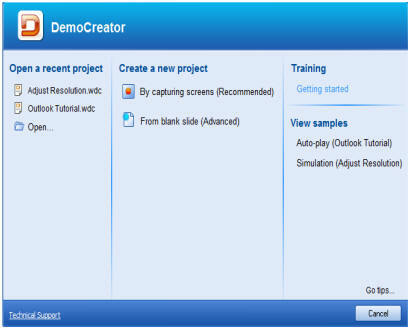 With DemoCreator you can easily edit each screen shot to make your demonstration even more clear. By using the edit menu toolbar it is easy to insert callouts, add buttons to activate presentation and insert other images to make your presentation even clearer. 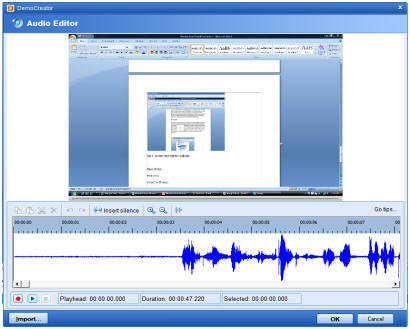 As well as visually displaying your presentation DemoCreator will also allow you to add sound to the presentation. In preview mode just click the Audio button followed by Record and starting chatting away into your microphone. DemoCreator comes equipped with its own Timeline editor which allow the user to specify when and for how long an object is displayed for. From within the Timeline editor you can drag blocks to different position on the timeline, alter the duration of the block and export the current frame as an image. Once you have edited your presentation and everything is to your satisfaction the only thing that remains is for you to publish your project to a suitable delivery application. Publishing is really simply and takes only a click of the Publish button and selecting which format you wish to publish your presentation to. 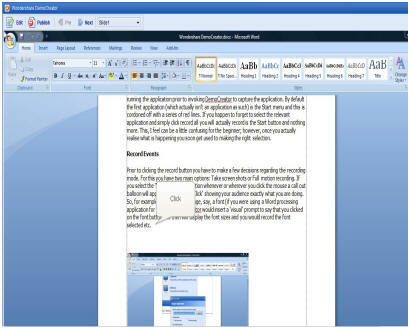 From here you have the choice of publishing to Flash, Video, LMS, .EXE or E-mail. Anyone interested in creating presentations or software tutorials will find DemoCreator of immense help. 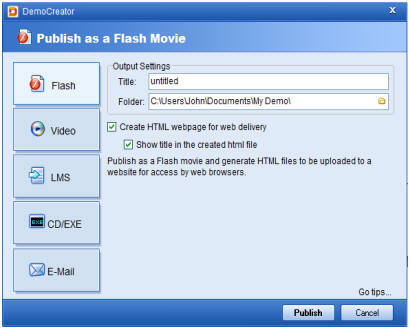 Creating, editing and publishing your created presentation is simply a breeze with presentations being able to be published in Flash, AVI CD/EXE, E-mail or even published as AICC/SCORM complaint LMS (Learning Management System) formats. Creating a presentation is not always the easiest of jobs to do, let alone get right first time. 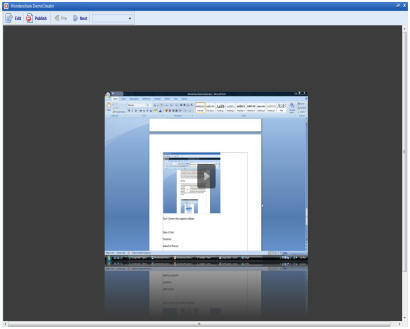 With DemoCreator you really can create a professional looking presentation in just a few simple clicks. Every part of the DemoCreator application is self explanatory, it is easy to use and you certainly don’t need a degree in professional multimedia skills to use it. DemoCreator is certainly worth taking a look at.